I have never served these to a kid, or an adult for that matter, who hasn’t loved them. No matter how many fries I make, there are never enough! These are the perfect addition to a summertime grilled meal. For more heat, add cumin and cayenne pepper to taste. This spice combination is also great mixed with butter and spread over a baked yam or a piece of toast. These flavorful fries definitely don’t need ketchup, but some kids (mine, for example), will want some anyway. Heat the oven to 400 degrees, cover a baking sheet with foil and set it aside. In a tiny bowl, combine the cinnamon, sugar and salt. Put the cut yams in a large mixing bowl and coat with the olive oil. Pour the spice mix over the yams and mix until they are evenly coated. 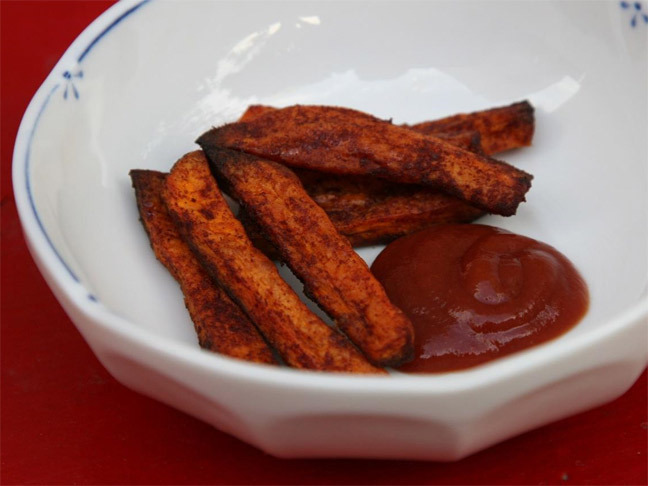 In one layer, if possible, spread the spiced yams on the foil-covered baking sheet and cook until the bottoms of the fries are starting to brown, about 15 minutes. Using a spatula, gently flip the fries and cook for another 10 to 15 minutes. Serve warm.